This listing is for a customized double-sided sweetheart wedding program digital file to print your own. If you are looking for something simple and sweet, this is it! Your guests will enjoy reading through this fun and whimsical program. - Anything you want to fit into the heart (order of events, songs, vows, etc). I suggest staying between 10 to 15 lines/pieces of information in total for the heart. 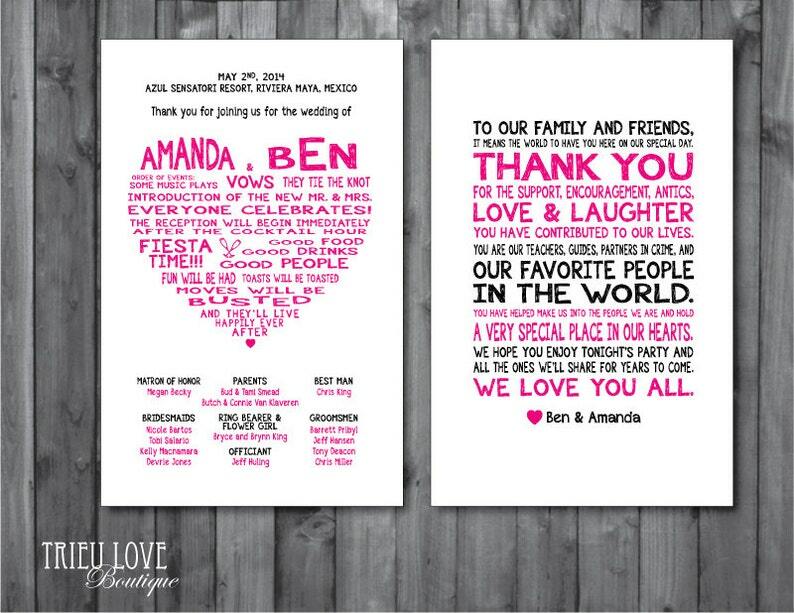 In order to create the big heart shape, the sizing and spacing of all the text will be customized for you. The color card in the last photo is just for guidance if you need, I can do any font color you like to match your wedding. 2 PDF files (one front, one back) with your final sweetheart program design for printing on letter size 8.5 x 11" paper. Let me know which option you want. Simply cut the paper into halves or quarters after printing. After payment is received I will deliver a digital file for your proofing. You may edit 2 times. I will then send you a final PDF file for printing. Please don't hesitate to message me to customize something to your liking! Together we can select any other color you like if you don't see one on the color card.